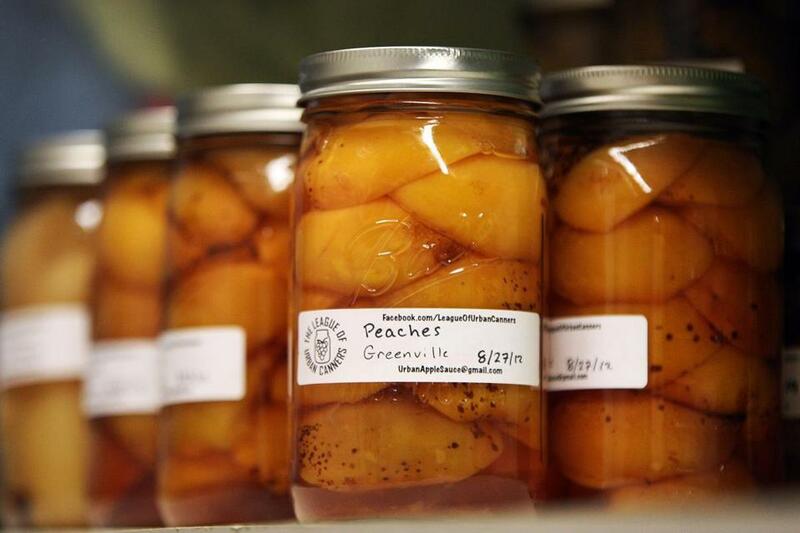 The League of Urban Canners is a new organization devoted to converting oft-neglected fruits from city lots and neighbors’ trees into jellies, jams, and preserves, such as the peaches. SOMERVILLE — Over the last few months, pantries, and basements here and in nearby neighborhoods have been filling up with a luscious assortment of homegrown treasures more typical of farmhouses than metropolitan triple-deckers. 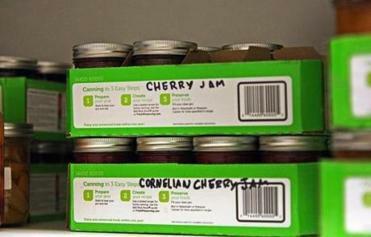 These jams, butters, chutneys, and jellies carry curious labels: Mass. Ave., Broadway, Nashua Street. The well-stocked shelves are the handiwork of the League of Urban Canners, a new organization devoted to converting often-wasted fruits from city lots into a delicious source of hyperlocal fare for long New England winters. The group is the brainchild of Sam Katz-Christy of Somerville, who was struck by inspiration last fall after receiving 10 pounds of plums from a neighbor who happened to have an unusually productive backyard tree. Armed with little more than a cookbook and a bit of courage, he and his family preserved their windfall in glistening Mason jars. The committed locavore, who commutes by bike to his job in Cambridge’s Central Square, began to notice just how much unused fruit was hiding in plain sight among the squares and one-way streets he traveled. His daily rides became a treasure hunt. After recruiting a posse of workers from his network of food-loving friends, he began knocking on doors, offering an unusual deal to the owners of neglected one-tree orchards: the League would pick their crop, can the harvest, and give residents back 10 percent of the results. The volunteers keep the rest. 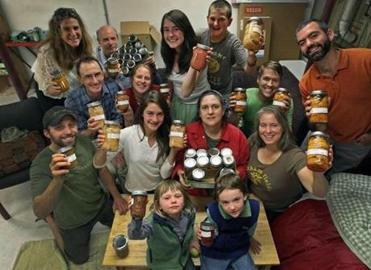 Pictured with preserves are (front row left to right): Charlie Marshall and Nico Nesson. Second row (left to right) Andy Reinmann, Nina Katz-Christy, Angela Davis, and Kerri Klugman. Third row (left to right) Janie Katz-Christy, Sam Katz-Christy, Matthew Schneiner, Liz Braun De Torrez, Molly Katz-Christy, Max Katz-Christy, Eric Cavanaugh, and Wayne Marshall. You need five ½-pint canning jars. Sterilize them by rinsing with boiling water. But the longtime Magoun Square resident was thrilled to hear there were people who would come to the aid of her small peach tree, whose branches were bent to the ground under the weight of a bumper crop. The senior was greatly relieved to know her prize beauties would be used and appreciated. The initiative has proven remarkably successful. More than 220 sites are currently listed in the League’s database, representing more than 3,500 pounds of collected fruit. Coordination is loose and casual. Teams of pickers, often consisting of families with children, follow the weather and their whim, heading out to claim their prizes with little more planning than a heads-up call to the property owner. Once gathered, the treasures are split among amateur confiture-makers who tend to bubbling pots in sometimes tiny home kitchens. Though at first the League expected to reap mostly apples and grapes, soon it became clear that Somerville, Cambridge, and Jamaica Plain were rich with ripe possibilities from mulberries to pears, raspberries to quince. A single tree in Harvard Square yielded 245 pounds of apricots, which turned into countless jars of jam. As the variety of raw materials grew, so did the group’s culinary horizons. Fruit leathers, syrups, vinegars, and hard cider took their places alongside the jellies, jams, and butters. The unlikely homesteaders have been rewarded with an opportunity to try flavors few have experienced, like muskily floral cornelian cherries and tangy crab apples. Katz-Christy considers the latter uniquely delectable. Some preserve enthusiasts are happiest with the most familiar treats. Rebecca Nesson of Cambridge has a winter stockpile in her cellar, the result of working late into the night after her kids have gone to sleep putting up all manner of preserves, jams, and chutneys such as green tomato and pear. Her favorite is simple grape jelly. “It’s in my kids’ peanut butter and jelly sandwiches every day. It’s nice to replace something I’ve been buying, and it’s very good,” says Nesson. DiMasi thoroughly enjoyed the rewards of her participation in the project: shiny, sweet yellow peaches suspended in thick syrup. DiMasi smiles as she recalls those sunny-hued delicacies. Kathleen Weldon can be reached at kjweldon@yahoo.com.